Beer festivals are hitting Portland right and left now that summer is officially here. Friday I was able to squeeze a trip to the North American Organic Brewers Festival into my lunch hour thanks to the earlier Friday start time of 12 noon. That's not bad: exercise (biking to and from Overlook Park), lunch, a little socializing, and some beer tasting all rolled into one. And if anyone asks, I just say I'm at lunch. The NAOBF has a lot of things going for it. Good organization, starting with arranging brewery stations in alphabetical order. A venue that has a more open feel than the cramped confines of the PIB or the narrow, dusty half-mile of the OBF. A format that allows breweries to exhibit more than one of their beers. Last year I was actually complaining about the venue, mainly because the lone tree in Overlook Park provided too little shade on such a hot day. I closed my report by saying "Hopefully next year it won't be 100 degrees out". My wish came true: the weather for the NAOBF was perfect this weekend. Even if it had been hot or rainy, the addition of tables and chairs under a good-sized tent made for a much better setup, and suddenly Overlook Park seems like a great place to hold a festival. The fact that a brewery can bring more than one beer to the festival may not seem like a huge deal, but I think it makes it possible to please beer snobs and more casual festival-goers at the same time. For example, Hopworks hit three targets at once by bringing their popular IPA, their entry-level Lager, and a new offering: Secession Cascadian Dark Ale. Something for everyone. My first sample of the Roots gruit had me very confused: the tap lines had been crossed, so for the first couple hours of the festival the Roots Pale Ale was being served as the gruit. It tasted suspiciously bitter for a hop-free beer, and I had to wonder what herb they had used for that: dandelion? quinine? Once the mistake was corrected, the world made a lot more sense, and it was fun to compare the Roots gruit with the Upright gruit, which it inspired. The gravity-dispensed Standing Stone IPA was a real treat. The Cascadian Dark from Hopworks was the only beer I went back for a full cup of: it presses all my hop and malt flavor buttons. I hope it becomes a regular part of the HUB lineup. Upright and Captured by Porches were at the NAOBF for the first time this year. But what happened to Hair of the Dog -- which won the People's Choice Award last year for Blue Dot -- and Walking Man? Surprising to see those fine breweries drop out of the lineup. Another gripe is the double-token charge for some of the bottled beers. I would certainly have tried the low-alcohol hefeweizen from German brewery Lammsbrau, but I couldn't bear to part with $2 for a tiny taste. Surely the cost of the bottles can be recovered on $1/sample. Or you can consider the festival's charge of $6 for a disposable plastic cup as a way of subsidizing loss-leaders like that. Last year was my first time to attend the NAOBF, and I was kind of lukewarm towards it. I definitely got a better impression this year. The weather played a role in that, but I think the addition of the tent was a good move, and giving the hard-core snobs an earlier opening time on Friday was nice also. I'll be looking forward to it next year. Six months ago when I was musing about pubs I was more likely to visit now that Oregon bans smoking in bars, the Moon and Sixpence was second only to the Horse Brass on my list. Turns out I have been going to the Brass a lot, but I guess the Moon is just far enough away from my house that Wednesday night was my first visit this year. Lagunitas founder Tony Magee was there to play some music, and some special Lagunitas treats were being served. Dave and I staked out a dartboard to entertain ourselves while we enjoyed cask-conditioned honest pints of Hop Stoopid and Little Sumpin' Sumpin', as well as a delicious bourbon-barrel Imperial Stout. Charles and Teresa hung out and chatted for a while before heading outside to listen to the music. The Sumpin' seemed an odd choice to have on cask, but the Hop Stoopid IPA worked very well for us -- although Ted over at Brewers Union thinks it's insane to try and serve these big IPAs cask-style. One thing I hadn't taken note of before was how nice the outside patio at M+6 is. There might be even more seating outside than inside, and with the weather we've had lately, it's a good place to be. Of course now the cigarette smoke that used to be inside the pub has moved to the patio, but it's not a problem outside, where it used to be annoyingly dense inside. Moon and Sixpence has a good dart setup: one room with two dartboards, and a kind of weird dog run with a single dartboard (but two chalkboards for scoring -- why?). The dart action, combined with a good selection of 15 taps and 2 casks, makes it a good destination in the Hollywood area. Last week the news came out that the insane 20X increase in Oregon's beer excise tax, HB 2461, was officially dead. Get ready, in two years the cycle will continue, and there will be another attempt to raise it again, to raise money and stick it to the sinners of the state. Since Oregon's initiative system is so easily gamed and the population will vote against any tax, the Oregon Brewers Guild should pre-empt the next debate by proposing a constitutional amendment that forbids or impedes future beer tax efforts. Why not? Get rid of the insane kicker. I hate the idea of a sales tax, but it makes more sense than a production-side tax like the excise tax, and would do more good in terms of smoothing out revenue during rough economic times. It looks like corporate taxes are going to get some tweaking by HB 3405, it will be interesting to see if that helps rebalance the income tax load -- 95% of which is currently borne by individuals in Oregon. And the kicker -- what madness. No household or business could survive a strategy that forced them to have a $0 bank balance at the end of every year. The kicker has one reason to exist, and that is to bankrupt the state government. Is that a good thing? Jeff Alworth linked to a very nice article by that beer-tax-raising devil Ben Cannon. In that article Rep. Cannon -- who somehow represents a chunk of Portland devoid of breweries and brewpubs -- admits to several flaws in his legislation. He admits that taxing the production side is a terrible idea, and grudgingly admits that a 15-cent per pint excise increase gets magnified before the consumer pays it, though he still doesn't have a businesslike grasp of how prices are set. He concludes by saying that he continues to support an increase of some kind. Gird yourselves, it's coming back in two years. Surprisingly, I seem to be the only Portland blogger -- maybe the only blogger anywhere -- to link to one of the brightest new beer-related blogs in town, A Pint for Dionysus. The author, semi-anonymous like many of us, signs his name as either "DM" or "grotusque", and he's at his best when he frames his beer adventures in a kind of confessional narrative, like this gem about an outing to a neighborhood dive. Ah yes, neighborhood dives. I sense a kindred spirit in Grotusque, someone who prefers the high life, but who can also enjoy a High Life. To illustrate what I'm talking about: he has taken on a "52 weeks" project to report on a different craft beer every Monday at Bailey's Taproom, yet he has a fair number of posts about Portland dives, like his recent writeup of the Slingshot. I hope he follows up on the hints that he's going to map out the Foster Road dive scene for us. The articles in A Pint for Dionysus seem about evenly divided between craft beer reports, dive bar investigations, and homebrewing anecdotes. A pretty good mix; about the only base he doesn't have covered is bikini bottle-opening tricks. I also like the idea of naming your blog after a capricious Greek god: after all, bloggers are self-appointed by divine right. Blog readers, put Dionysus into your mix. Blog authors, give some juice to a new voice. Grotusque, keep up the good work. After a full slate of afternoon and evening activities this past Saturday, Carla, Clark and I were still able to make it over to Ezra's excellent Baltic Porter tasting at Upright Brewing. The room was packed with so many local beer mavens that it's tempting to write this up gossip-column style, with names in bold and descriptions of each celebrity's beer T-shirt. I'll resist the temptation and talk about the beers instead. 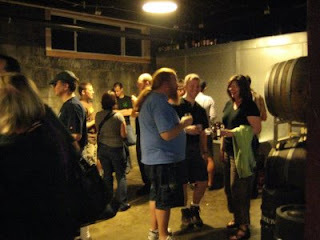 In addition to bottled porters imported from Baltic nations, the tasting also featured some Portland-brewed imperial porters and stouts, and four of Upright's beers on tap. Because of our late entry and early exit, I didn't really get in on many of the bottled porters. Of note were some very old bottles of Full Sail Imperial Porter donated by John Harris -- from 1997, 1999, and 2001, I think. The 2001 was hanging in there, but the older ones had gone too far around the bend. It reinforces my suspicion that bottled beer should be drunk within a couple of years. On the other hand, a few months ago the Pilsner Room had a keg of the 1998 Imperial Stout which was still in pretty good shape. It wouldn't be too surprising if kegs were safer to age beer in than bottles. Of the few imports I got to try, the standout was the Limfjords Porter from Thisted Brewery in Denmark. Ezra's friend Jimmy brought it in from New Jersey; I hope it becomes available here. It was thick, rich, and round, just like you'd want a big porter to be. The bottle called it a double brown stout. Speaking of thick and rich, the thickest beer of the night -- and one of my favorites -- was the Lucky Lab Pavlov's Imperial Stout that was on tap. Black and viscous, with little carbonation, it was like a delicious cross between stout and Ovaltine -- very malty. I had high hopes for another Oregon beer on tap, the Block 15 Smoked Porter, but it was a little light, especially up against so many other big beers. Since it was my first visit to Upright, it was fun to look around the premises, and to see Alex's open fermentation setup. Don't worry, I didn't contaminate it, I just peeked through a window into the fermentation room. 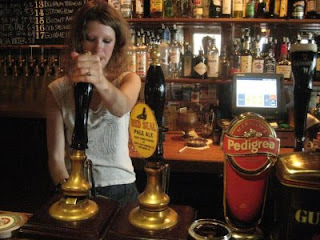 I got to try a couple of Upright beers I hadn't had before: the Seven and the Anglo Saison. Seven is a delicious, big biere de garde, a nice, drinkable version of that style. I'd love to try that after it ages a while. The Anglo Saison seems to be Alex's nod to Northwest tastes in hops -- Upright's house saison style done up with an IPA dose of hops. Another winner. Upright's fabulous Reggae Junkie Gruit was also on tap. I tried it last week at the Green Dragon, but it was definitely worth another try Saturday night. If you've had the Gruit Kolsch at Roots, it will remind you of that, but it has its own character also. I'm a sucker for the flavor of lemongrass, which is one of the herbs in the Upright Gruit. Very drinkable, and under 5% ABV, if I remember correctly. Finally, Alex shared around a small glass of the not-quite-finished summer wheat beer, so I got a tiny taste of that. It's satisfyingly hearty, and will be a big hit this summer. The tasting was a wonderful event, I only regret that I had such a short time there. Matt has a terrific set of pictures. Thanks a lot to Ezra for putting it together, and to Alex for hosting! In my frequent tirades against high growler prices, I make the claim that the cost of filling a growler with beer should be in the ballpark of the price of a six-pack of similar quality. They serve the same end, namely taking some beer home. Thus was born the six-pack equivalent, or SPE: a way to wrap your mind around the cost of filling a growler. Even though no one would expect beer consumed at the point of sale to be priced similarly to a retail six-pack, the six-pack equivalent is still a useful way to compare prices in a situation where the volumes offered are different. For example, in writing up PGE Park, I compared the SPE of PGE's 12 and 20 ounce cups ($45 and $29.70 respectively). Or you could compare the price of imperial pints at Bailey's Taproom with that of cheater pints nearby at Henry's, and see who gives you a better deal. It helps put a lot of things into perspective. For instance, I was surprised to find that my $11 bombers of Mirror Mirror cost me an SPE of $36. Compare Sierra Nevada Bigfoot for about $11/six-pack at the 7-11. Or consider that Full Sail Session -- because of the 11-ounce bottles -- has an SPE of $6 for an $11 12-pack. Not as good as the $5.50 if the bottles held 12 ounces.I was just guessing about how much actual beer is in 20- or 16-ounce glasses, figuring you lose about an ounce for the head on the beer. Anyone have any scientific data? Also, let's have a round of applause for those establishments with a fill line marked on the glass: Brewers Union, Deschutes, Belmont Station, and Hopworks. Give the calculator a whirl. Find any interesting bargains or rip-offs? I spent last week at my company's headquarters in Sunnyvale, California. We have a teenage fan of Buffy the Vampire Slayer in our house, so we jokingly refer to Sunnyvale as "Hellmouth" -- the vampire conduit that Buffy's town of Sunnydale sits atop. If you're a Portland beer snob the South Bay is indeed a kind of beer Hell. San Jose is the third-largest city in California, twice as big as Portland, and it sports a measly four brewpubs. Sunnyvale is relatively lucky, with two brewpubs, and a Tied House location nearby in Mountain View. How is it that Palo Alto has no brewpubs? I thought Stanford was full of geniuses. All right, forget brewpubs, there should be some good beer bars.... Tacky Irish pubs seem to be about as good as it gets, which isn't so good. 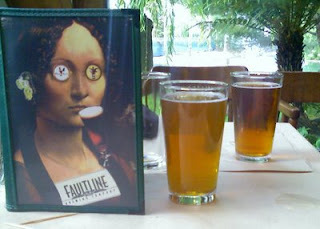 The saving grace in the area is Faultline Brewing, just off 101 in Sunnyvale. They have a decent selection of regular beers, nitro taps and a cask engine, and interesting seasonals. The Maibock seasonal was too strong at 7.2% for session purposes last week, so I stuck to the cask Pale Ale and the Best Bitter on nitro. The Pale is perfect for dinner and conversation, floral but not too bitter. 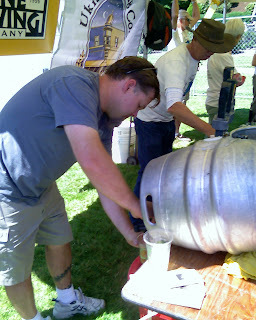 The cloudy cask-conditioned version was a little more flavorful than the regular tap. Not to belittle the beer, but what's even better is the food at Faultline. It's not cheap -- $18 to $25 dinner entrees -- but it's wonderful. The portions are embarrassingly large, which is an embarrassment I'm always willing to endure. Sometimes large portions mask an inattentiveness in the food quality, but that's not the case at Faultline. The seafood gumbo was dense with fish, shrimp, and sausage, and threatened to spill over the brim of its large plate. The Macadamia-Crusted Tilapia was perfectly crisp, and similarly huge. I'm racking my brains trying to think of a Portland restaurant to compare it to. Maybe a cross between the big plates at Deschutes and the interesting menu at the harborside McCormick and Schmick's, with higher quality than those two put together. When I was 7 years old, the big excitement was to bike over to the Quik Trip or the Git-N-Go to buy a pack of Topps Wacky Packages -- stickers that lampooned various national brands of consumer products. The baseball-card company sold these hilarious stickers with pink rectangles of their brittle, tasteless chewing gum. The bad attitude was right on the money for television-addled kids our age. A couple months ago I found a picture book at Counter Media showing all seven series of Wacky Packages stickers published in 1973 and 1974. Turns out that the instigator of the Wacky Package project at Topps was Art Spiegelman, who went on to more intellectual glory as the author of the graphic novel Maus . In the preface to the Wacky Packages book, Spiegelman reveals that he recruited other comics authors to make up gags for the stickers, including Bill Griffith, the author of Zippy the Pinhead. The only beer Wacky Package that came out in the 70s was the Blast Blew Ribbon sticker pictured here. Today it would be surprising if collectors cards for kids had even one joke about alcohol, but the reason I'm surprised there is only one is that there were no fewer than nineteen stickers mocking brands of cigarettes or cigars -- not to mention a breakfast cereal called Super Cigar Crisp, with a cartoon bear puffing away on the box. It looks like Topps has been selling Wacky Packages again the last few years, but I'll bet the alcohol and tobacco references are now taboo. The book does come with a Schmutz Beer sticker from back in the day that was never released, as well as a variant of the Blast Blew Ribbon one shown here. It's one of the ironies of Portland that Pabst is so popular here. Do you suppose the sticker is correct, that the original flavor used to taste different?